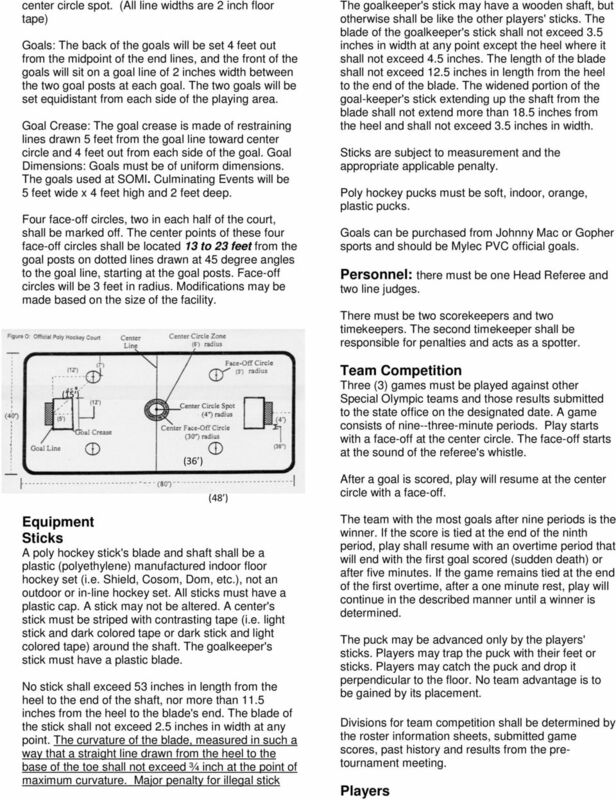 Download "POLY HOCKEY. SOMI-Specific Information Sport season: September- November"
4 into the goal in any way by a defending player during the game. In order for a goal to count, the puck needs to be in the goal before the referee's signal sounds. A goal can be scored from a face-off in any location. Goalkeeping The goalkeeper may use his/her hands or stick to clear the puck away from the goal or out of the goal crease. A dotted line will extend from the goal pipe at a 45 degree angle to the side face-off circles. The goal-keeper may sweep or toss the puck in an underhand manner behind these lines. The goalkeeper may shoot the puck in any direction, without the 45 degree restriction, with his/her stick, but must remain in the crease to do so. The goalkeeper cannot hold the puck for more than three seconds. The goalkeeper must start in a standing position. This means not kneeling or sitting, but with both feet flat on the court. The goalkeeper may go down in front of the goal to make a save, but may not remain on the ground in front of the goal for more than three seconds. The goalkeeper must remain in contact with the crease when playing the puck. A goalkeeper can be removed from the game at any time during a normal stoppage of play. The replacement player can play defense or forward positions. They may not be a center. The goalkeeper may return to the game, replacing the substitute who was originally substituted for him/her at a normal stoppage of play. Minor Fouls Minor fouls result in the referee stopping play. Play is resumed with a face-off in the offending team's defensive circle. In certain minor fouls, a delayed penalty may be called. When a delayed penalty occurs, the referee raises his/her hand into the air to signal a delayed penalty. 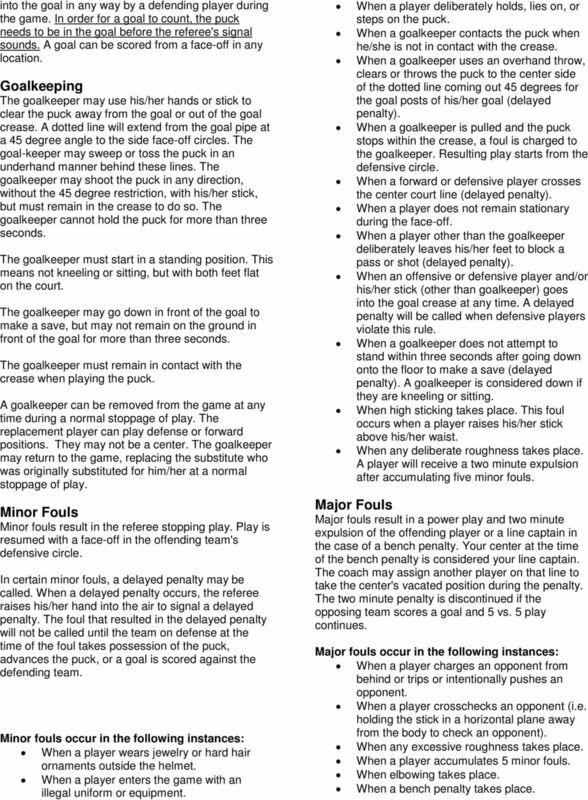 The foul that resulted in the delayed penalty will not be called until the team on defense at the time of the foul takes possession of the puck, advances the puck, or a goal is scored against the defending team. Minor fouls occur in the following instances: When a player wears jewelry or hard hair ornaments outside the helmet. When a player enters the game with an illegal uniform or equipment. When a player deliberately holds, lies on, or steps on the puck. When a goalkeeper contacts the puck when he/she is not in contact with the crease. When a goalkeeper uses an overhand throw, clears or throws the puck to the center side of the dotted line coming out 45 degrees for the goal posts of his/her goal (delayed penalty). When a goalkeeper is pulled and the puck stops within the crease, a foul is charged to the goalkeeper. Resulting play starts from the defensive circle. When a forward or defensive player crosses the center court line (delayed penalty). When a player does not remain stationary during the face-off. When a player other than the goalkeeper deliberately leaves his/her feet to block a pass or shot (delayed penalty). When an offensive or defensive player and/or his/her stick (other than goalkeeper) goes into the goal crease at any time. A delayed penalty will be called when defensive players violate this rule. When a goalkeeper does not attempt to stand within three seconds after going down onto the floor to make a save (delayed penalty). A goalkeeper is considered down if they are kneeling or sitting. When high sticking takes place. This foul occurs when a player raises his/her stick above his/her waist. When any deliberate roughness takes place. A player will receive a two minute expulsion after accumulating five minor fouls. Major Fouls Major fouls result in a power play and two minute expulsion of the offending player or a line captain in the case of a bench penalty. Your center at the time of the bench penalty is considered your line captain. The coach may assign another player on that line to take the center's vacated position during the penalty. 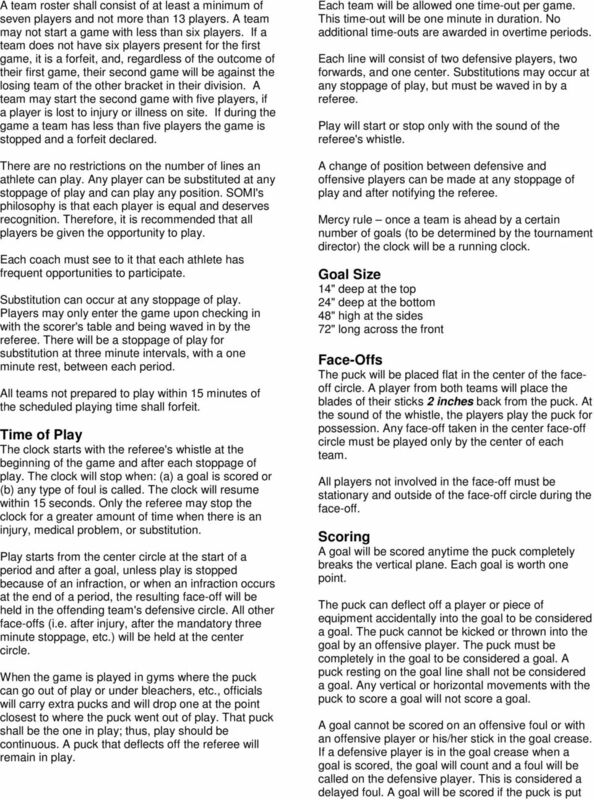 The two minute penalty is discontinued if the opposing team scores a goal and 5 vs. 5 play continues. Major fouls occur in the following instances: When a player charges an opponent from behind or trips or intentionally pushes an opponent. When a player crosschecks an opponent (i.e. holding the stick in a horizontal plane away from the body to check an opponent). When any excessive roughness takes place. When a player accumulates 5 minor fouls. When elbowing takes place. When a bench penalty takes place. 6 Event #3 - Stick Handling 1. Purpose: To evaluate the athlete's speed and ability to handle the puck. 2. Equipment: Poly hockey stick, puck, 6 traffic cones, tape and a goal. 3. Description: Athlete stick handles the puck from a starting line through a course defined by cones and shoots the puck at the goal. The distance from the start line to goal line shall be 21 meters. The cones shall be placed in a straight line at intervals of 3 meters. The clock stops when the puck passes the goal line. (See Figure R) 4. The time spent stick handling is subtracted from 60. If any cones are missed, one point is subtracted for each miss. Five bonus points are given if the athlete scores a goal. Event #4 - Shoot For Accuracy 1. Purpose: To evaluate the athlete's accuracy, power and ability to score by shooting the puck into specific areas of the goal. 2. 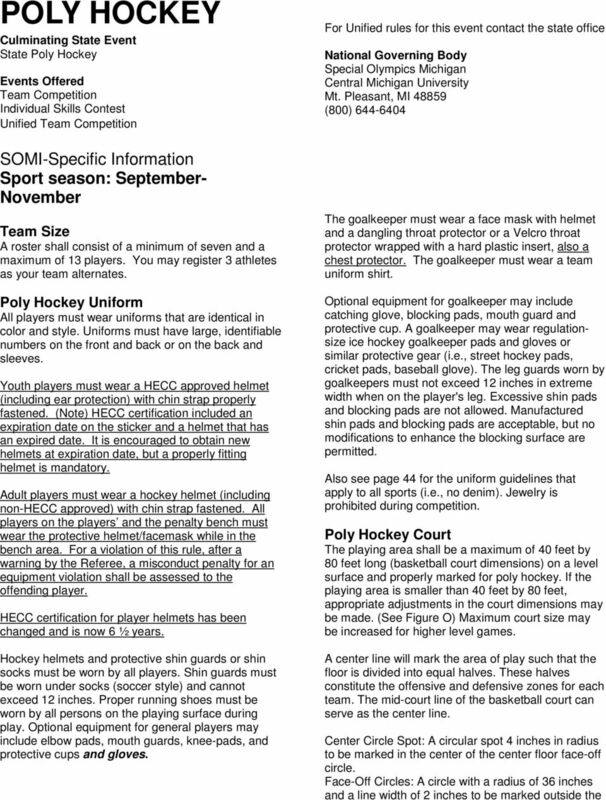 Equipment: Poly hockey stick, puck, goal and tape or rope. 3. Description: Athlete takes five shots from behind a line that is five meters from and directly in front of, the goal. Six sections are defined within the goal by rope or tape as shown in the diagram. The vertical rope or tape is hung 45 cm (18") in from each goal post. The horizontal rope or tape is strung 30 cm (12") above the floor. (See Figure S) 4. 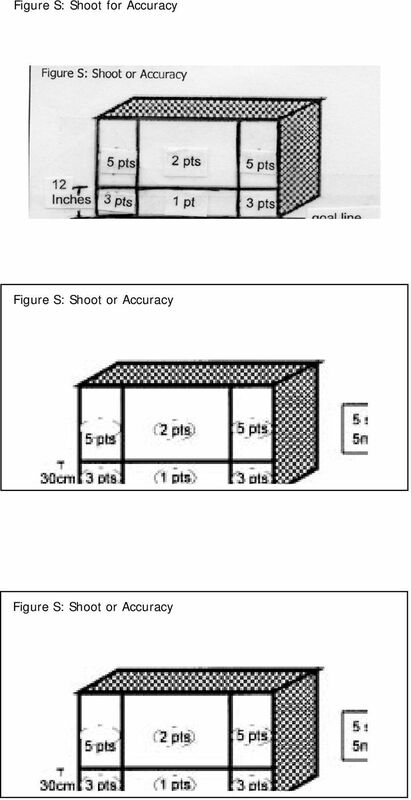 Scoring: The goal is divided into point sections as follows: -5 points for any shot entering the goal in either of the upper corners. -3 points for any shot entering the goal in either of the lower corners. 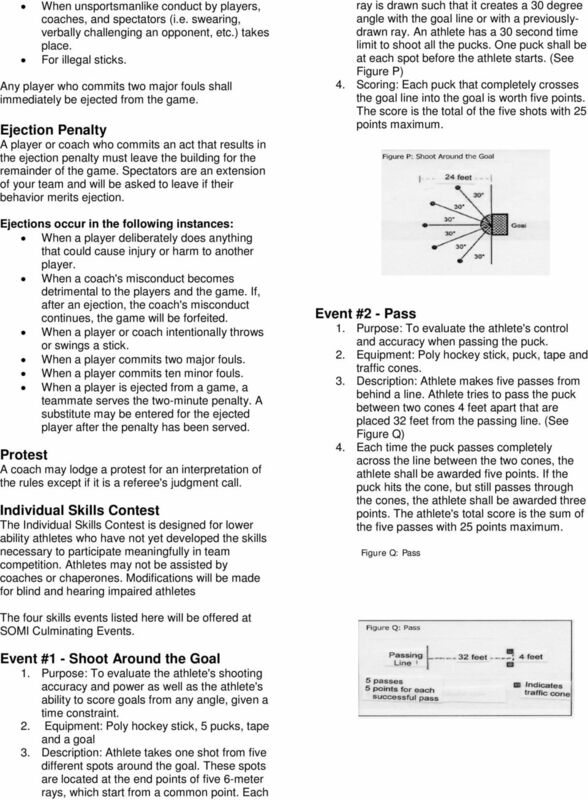 -2 points for any shot entering the goal in the upper middle section. -1 point for any shot entering the goal in the lower middle section. -0 points for any shot not entering the goal.